My coffee is pleasantly warm in my hand as I run my finger down the bindings of hardbound books in the Science and Nature section. I sigh contently as coffee aroma and wood pulp intertwine. I pull out a book by Carl Sagan and his tinny voice grates as he whines about the uneducated youth of today and I re-shelve his book muffling his voice. I finger a Richard Dawkins book, curious about his genius, but put off by his everybody-but-me-is-stupid tone, and I re-shelve him too. Richard Feynman, the physics genius slash ladies man, yep, you’re coming home with me. I briefly browse the sale books and head to the front to pay for my date—I mean book. The cashier rings me up then asks if I would like a free e-book version with this purchase. Why yes, I would thanks. I present my email address and it is automatically added to my account library. When will the above fantasy become reality? Whenever a new medium arrives it is greeted with enthusiasm by consumers and fear by publishing houses. Why not embrace it and leverage the opportunity to adapt a tired system? For years, downloading music was something a person did in fear of having their kneecaps crushed by RIAA thugs. It took Apple to make it mainstream, and it is currently the way music is distributed. When was the last time you bought a CD? Likewise, it is time to phase out the paperback, bequeathing the e-book its affordable price. Paperbacks are a disposable medium, whose binding is good for one or two readings before pages start falling out and it loses it’s shape. They are an environmental disaster: the wood pulp needed, chemicals used during production, trucks blowing smoke to deliver them to the stores and warehouses, all so they can be read a few times and tossed. The e-reader is a much better solution. (Or would be if their production was greener and they lasted longer than a couple years. 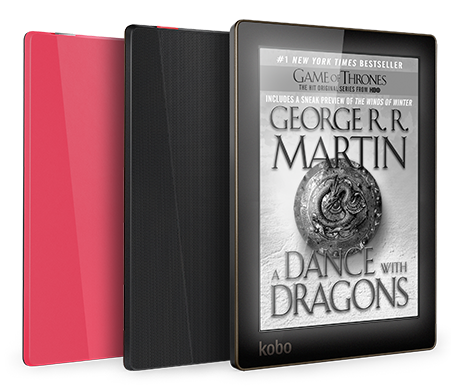 Perhaps I should say they will be a better solution, someday...) For now tiny e-ink Kobo & Nook readers are available for about $80 with their prices falling. If you are thrift minded, use the Library2Go system until the cost is recouped. Also there are many 99¢ classics to be read. Even independent booksellers are on their way to figuring out how to work with the e-book revolution. Used books stores also prefer hardbound books; bring a pile of genre based paperbacks to Powell's book buyer and watch his face. When my mother-in-law was gifted her Kindle, my curiosity ignited. Like a monkey investigating a plastic banana, I took it warily, turned it, gave it a sniff, then set it aside, certain I would always prefer real bananas and their familiar textures and smell. A year or two later the Nook Color launched. From this nifty little banana, I could read in a dark room, check my email, sling cartoon birds, as well as tuck a thousand page GRRM tome in my purse. Now, I have my own plastic banana. I still love books—real ones, and believe they have a place in the world, but paperbacks have overstayed their welcome. Publishers need to accept that people, (I loathe the word consumer) attach value to something physical, and since they can’t touch and feel intellectual property delivered in 1s and 0s they’re not going to pay a bloated price for it. The equipment is washed and ready. The ingredients, laid out. The recipe, displayed prominently. Kids, out from underfoot. Let's brew! Charley pulled out and washed his new cookware, while talking me through the process using words like wort, fermentor, Fuggle and Goldings, as though he'd been born to them. Tenderly he packed the grains into gauzy bags and placed them in the cold water bringing them to 180 degrees. At the appointed time and temperature he removed the grains brought it to a rolling boil and added the malt extract. He watched, monitored the temperature, timed, and stirred. He added hops once, twice, five times before the final buzzer rang, signaling the completion of his first cook. He then poured the mixture into the fermentor and waited for the thermometer, that was taped to the side of the bucket, to indicate when the wort was to cool enough to add the brewer's yeast. Like an expectant father, he paced, shifted foot to foot, randomly feeling the sides to see if it felt cooler to the touch. Yet the thermometer remained black. An hour or so passed in this way before he began to fret that the thermometer was defective. He took our forehead thermometer, set it to object, and gave it a go. It read 95 degrees. Too anxious to wait, he filled up our bath tub with cold water and gently, tenderly, set his sealed fermentor in it, the water level just below the thermometer. In about an hour it was cool. Triumphant, Charley then added the brewer's yeast and plugged in the airlock. For a week, the airlock bubbled away, as the yeast metabolized the sugar leaving alcohol and CO2 behind. Then the bubbling action in the airlock slowed sufficiently to indicate that the yeast was done performing its magic. that would give the beer a "skunky" flavor. This step involved siphoning the beer-to-be from the fermentor to the carboy, then sealing it off with another airlock. Another week. To create carbonation, the remaining yeast microbes are fed corn sugar. Once blended, the beer is siphoned off into freshly sanitized bottles and capped. It would be one week more before the first bottle would be ready for sampling. Broken Boom Bitter of Shoalwater Brewing is a fine name that is worthy of a fine label. Charley found a photo from last year's regatta that has many of his favorite people, complete with sailboats being rigged on the bay. As an added bonus, Lina's dog Buck, who recently passed away, is supervising the work curled up in a sunny spot in the grass. Charley played with the picture in Photoshop and settled on a colored pencil filter. He left it up on the computer for me to look at, as he left to put Danielle to bed. 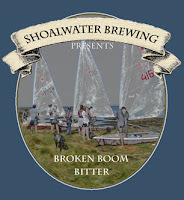 From there, I added a circle frame and three borders, a banner graphic and text for Shoalwater Brewing and the text for the Broken Boom Bitter name at the bottom. Then again from Main Brew he acquired some label paper. I headed off to Kinko's to have it laser printed, lest our inkjet leave his drinkers with colored hands and a smeared label. After carefully placing the paper in the tray, such that it would print on the paper side instead of the glue, I went ahead and printed on the glue side. Luckily, I had only used half the paper. I flipped the next batch and managed to get it on the correct side. Charley seized his first free moment to apply them to the bottles. This Monday was officially one week and one day since adding the corn sugar. It was time. We were having dinner with our good friends, Mike and Stephanie. He pulled the bottle out with a shy smile and set it on the table. A few moments later, he popped the top and it gave the slightest hiss, much to Charley's relief. He poured it into equal thirds in Dixie cups, careful to leave the last inch or so in the bottle. (Sediment.) We clinked our cups—cheers! each taking a tentative sip then a hearty draught. It was pleasantly carbonated, full of flavor, not the least bit bitter—it was lovely. Even the non-beer drinker, Stephanie, requested a taste. She affirmed that it indeed tasted like beer. Then placed a request for a bottle for her brother. Everybody needs a thing. Something that stretches us, excites us, and interests us. Something that we are good at, simply because it feels like play. For some it's music, or sketching, sailing, or collecting pinball machines, for me it's writing. I'm glad that Charley has found a thing too. I'm doing a daily clean-up on our house, wondering what a man would want for his 40th birthday. A man that has every electronic gizmo he could want, and for whom a Porsche Carrera isn't a financial feasibility. What he needs is a hobby. Something to do that fulfills that need to create—something to be energized about. This is dangerous territory for a wife, she must ensure that this hobby gift is free of any perceived strings. For example, a new power tool might suggest she expects he use it to rebuild our ailing fence, instead of the totem pole he's always wanted to see if he could create... A gift certificate is too vague and might end up being used for something practical... I make my way in from our front room to our kitchen and start cleaning up there. I clear off one counter and wipe it down, then fish out a paper bag to load up a collection of beer bottles... Eureka! Thrilled, yet totally in ignorant about home brewing apparatus, I started at Main Brew's website, (a store I noticed off of highway 26) and checked out their starter kits. I settled on one and stole some time to go out and look. I parked the pickup and pushed through the door framed by two hops vines climbing ropes—looks like I'm in the right spot. Although the building is huge, the store is remarkably cramped with product crammed in every nook. On the right, next to a metal setup that looks like a 14th century alchemist's setup, is a rack of books; ah yes, I know books, a good place to start. I pull a book about cider, and explore the store. I can't find anything that remotely resembles what I saw online. I wander past large glass and plastic jugs, wine making kits, empty bottles, caps and tools of unfathomable purpose. Then past sweet smelling grains and big barrels with what looks like molasses oozing from the spigot. I slide past the barrels into what looks like a storage area, and a guy on the phone leans in and asks if I'm looking for something. "Did I wander into no-man's-land?" He nods and grins... I wind my way back to the front counter, clearly I'm not in a supermarket. I wait in line to ask help from a guy who looks like he rolled out of bed at the crack of noon and fell into some clothes. When it was my turn, I explained that I wanted to get my husband a starter kit for brewing cider and that I'd like to add whatever he needed to also brew beer, so he'd have something play with until the Columbia Gorge apples came into season. He lit up. Here is a man who loves his job. He explained the details and options without drowning me in lingo. He swung around the counter and started pulling parts for the kits. He briefly showed me around the store and told me to show Charley the starter videos on their website and also invited him to come in for a store tour and help brewing his first batch. He explained that they like to walk new customers through their first brew before turning them loose. Based on my experience, I felt this was an excellent idea. Grateful, I thanked him, paid for the kits, and headed home. On the day of his birthday, I was nervous. He had been talking about brewing cider a lot lately and also talked quite a bit about co-workers that home brew, but still... The girls and I brought out his cake, sang the birthday song, complete with the, "You look like a Monkey—aaand you smell like one too!" verse. Then he opened the two wrapped gifts, the cider book and the beer brewing book that came with the kit. He seemed pleased. The girls and I hauled the apparatus from the closet piece by piece. He poked through the stuff and from then on spent every spare moment he could find, reading the books, watching the videos and counting the hours until he could go in and get his first batch of ingredients. Tucked in a birthday card from his parents was a check—perfect! Off he headed to Main Brew to return light footed and laden with goods, and a recipe for Bitter. It is Charley’s birthday and the kids are home with Oma and Opa, as we find our seats along the third base line, a few rows up. The view is excellent, as it is with almost all the seating—one of the many benefits of a small ball park. The stadium smells pleasantly of new car. The incredibly young looking ball players warm up. We rise for the national anthem, then we lower to our seats and raise up our beers. Go Hops! We are dressed in our Boston shirts and capped with Hillsboro Hops hats. A combination we see repeated in many of the other newly minted Hillsboro Hops fans. Play Ball! The Hops are playing the Spokane Indians tonight, and our pitcher burns in a 91 mph fastball. We cheer for the ump's signal for strike one. Single A though the league may be, we are spending a warm summer evening drinking a Bridgeport Long Ball Ale, eating a salt encrusted pretzel, cheering on our boys as they play with everything they've got. It is good. We lasted about seven innings before Charley and I called the game due to excessive toddler chasing and showers of whine. All in all, it was a fun afternoon and a pretty good first attempt. It may take a half dozen lemonades and hot dogs but we'll make baseball fans of them yet. Meanwhile Charley and I can reclaim one of the many interests we've benched since having kids. A cool breeze and bases loaded brings up goosebumps as the sun sets on the bottom of the ninth and Charley’s birthday. The Hops are down by two and there is one out. We chant “Yo-gey! Yo-gey!” as he goes down swinging. Roberts is up to bat. He is due. He thinks so too and strikes out swinging with everything he had at a ball that was in the dirt. Hops lose. Buy hey, that’s baseball. What a game. Happy Birthday Charley. Pre-game dinner at Helvetia Tavern. We arrived in time to see Boston lose to the Yankees.